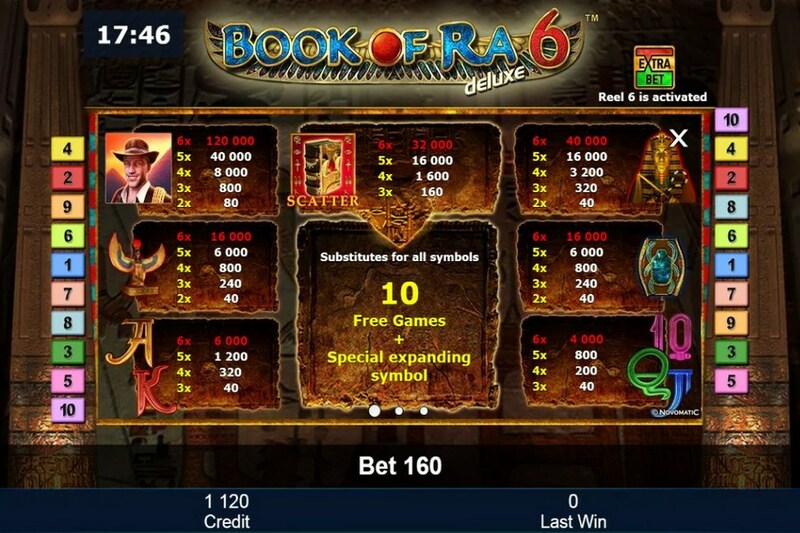 With the video slot game Book of Ra Deluxe 6 takes us on a mysterious adventure into the royal burial chambers, along six reels in search of the Pharaoh’s gold with the help of Ra’s book. 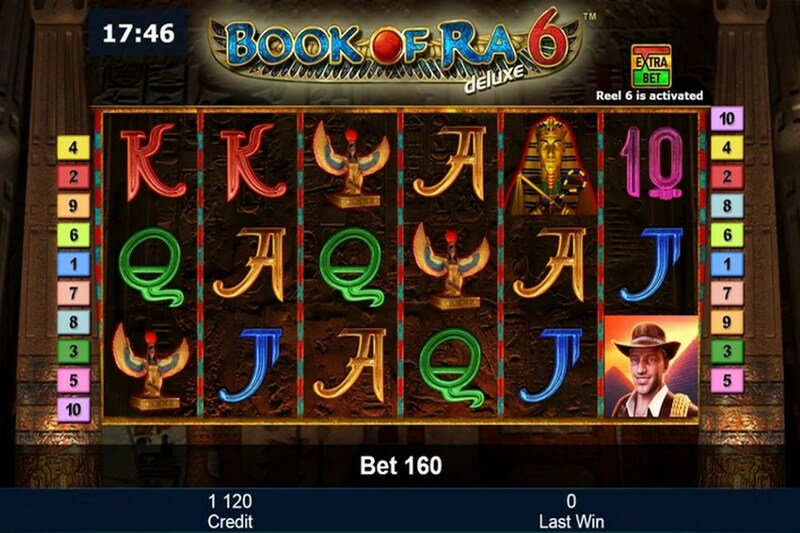 The aim of slot machine game Book of Ra™ deluxe 6 is to land 5 matching symbols side by side along the win lines. The winning patterns run from left to right. Set in an Egyptian tomb setting you’ll find slot symbols on the reels, as we mentioned, that may already be familiar to you. The explorer who resembles Indiana Jones is the top paying symbol and landing 6 of him across the reels will earn you the top jackpot of 60,000x your bet. Other symbols include the mystical Book of Ra, a Pharaoh’s tomb, a scarab beetle, the God Ra, as well as the standard card symbols of 10 through ace to round out the slots symbols. 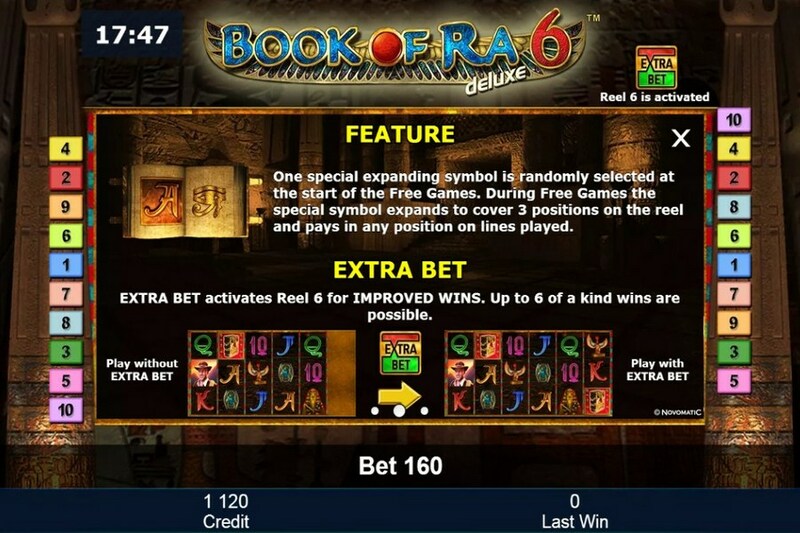 The single most important symbol of slot in this game is the Book of Ra as it acts as the Wild, Scatter and Free Spins trigger so be on the lookout for that one! Ten free spin games await if you land three or more books anywhere on the screen. A bonus symbol is randomly chosen with the help of Ra's Book when you enter your first free spin. The bonus symbol expands to all reel positions in the free game and pays in any position. You can activate or deactivate the 6th reel with the option 'Extra Bet'. Phenomenal winning chances await you as soon as you play on 6 reels!